I am just back from Mediawiki Berlin Hackathon. On May 13 to 15, Mediawiki developers attended the hackathon and squashed many bugs and discussed many features. Members of language committee had its first real-life meeting in parallel with hackathon. It was a nice event, learned a lot, talked to many awesome hackers and linguists. Niklas Laxström and Siebrand reviewed the WebFonts extension and enabled at translatewiki.net. Fixed a few bugs that Niklas reported on the extension. Recently Sourashtra wikipedia project was started in the wikimedia incubator : http://incubator.wikimedia.org/wiki/Wp/saz and Mediawiki localization started in translatewiki Since the language did not had any proper fonts or input tools, this was not going well. When we add a new language support in Mediawiki or start a new language wikipedia, we need to develop the language technology ecosystem to support its growth. This ecosystem comprises of Unicode code points for the script, proper fonts, rendering support, input tools, availability of these fonts and input tools in operating systems or alternate ways to get it working in operating system etc. Sourashtra language had a unicode font developed by Prabu M Rengachari, named ‘Sourashtra’ itself. The font had problems with browsers/operating systems. We fixed to make it work properly. The font was not licensed properly. Prabu agreed to release it in GNU GPLV3 license with font exception. He also agreed to rename the font to another name other than the script name itself. Once we have a font with proper license, we wanted it to be available in operating systems. I filed a packaging request in Debian. Vasudev Kamath of Debian India Team packaged it and now it is available in debian unstable(sid). Parag Nemade of Fedora India packaged the font for Fedora and will be avialable in upcoming Fedora 15. To add a new language support in operating system, we need a locale definition. In GNU Linux this is GLibc locale definition. With the help of Prabu, I prepared the saz_IN locale file for glibc, and filed as bug report to add to glibc. I hope, soon it will be part of Glibc. Well, all of these was possible since it was GNU/Linux or Free software. Things are a bit difficult on the other side, proprietary operating system world. There is nothing we can do with those operating systems. Since there is no ‘market’ for these minority language, it won’t come to the priority of those companies to add support for these languages. Users will see squares or question marks when they visit sourashtra wikipedia. We are working on a solution for this, not only for sourashtra, but a common solution for all languages. We are developing a webfonts extension for Mediawiki to provide font embedding in wiki pages to avoid the necessity of having fonts installed in user’s computers. The extension is in development and one can preview it in my test wiki. For Sourashtra, we added webfonts support(preview) . Input tools needs to be developed and packaged. For mediaiwki, with the help of Narayam extension, we can easily add this support. With the silpa project, I added a server side, PDF/PNG/SVG rendering support for Sourashtra as well. 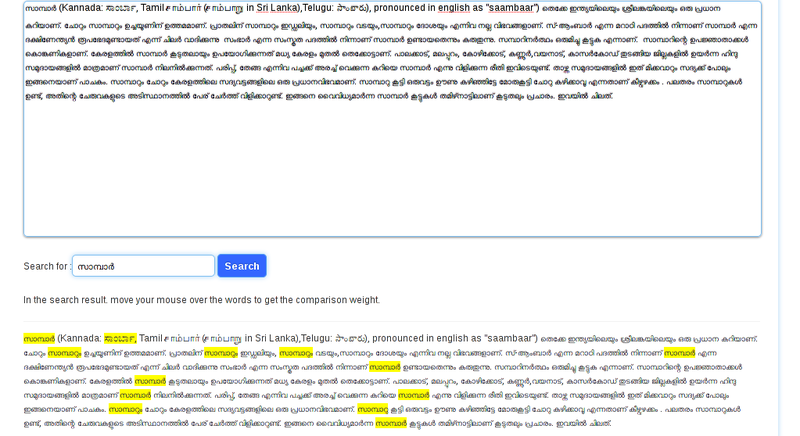 The Malayalam word സാമ്പാര്‍ is compared against a paragraph from http://ml.wikipedia.org/wiki/Sambar. In the bottom half, words marked in yellow color are search results. You can see that a Kannada word ಸಾಂಬಾರ್‍ is matched for Malayalam word. And that is why this is called cross-language. The inflections of the words സാമ്പാര്‍ – സാമ്പാറും, സാമ്പാറു etc are also found as results. This is the kind of search we need in Indic languages, not just the letter by letter comparison we do for English. This is a Fuzzy string search application. This application illustrates the combined use of Edit distance and Indic Soundex algorithm. By mixing both written like(edit distance) and sounds like(soundex), we achieve an efficient aproximate string searching. This application is capable of cross language string search too. That means, you can search Hindi words in Malayalam text. If there is any Malayalam word, which is approximate transliteration of hindi word, or sounds alike the Hindi words, it will be returned as an approximate match. The “written like” algorithm used here is a bigram average algorithm. The ratio of common bigrams in two strings and average number of bigrams will give a factor which is greater than zero and less than 1. Similarly the soundex algorithm also gives a weight. By selecting words which has comparison weight more than the threshold weight(which 0.6), we get the search results. I left Chennai on Wednesday(8th) and reached Frankfurt airport on Thursday morning. Rest of the people from India for wikimania- Shiju Alex, Tinu Cherian, Srinivas Gunta, Arjun Rao were already reached the airport and I joined them. We reached Gdansk Airport by 12.30 PM. Our accommodation was at a students hostel of Gdansk University. Language was a big issue since most of the people does not understand English and only know Polish Language. The lady at the reception of the hostel we stayed was using Google translate tool for communicating with us. The Gdansk city is a very beautiful city with streets of big brick made tall buildings. The conference started on Friday morning. Sue Gardner, Executive Director of the Wikimedia Foundation. talked about the strategies of foundation, and it followed by a QnA with wikimedia board members. We presented the Malayalam CD to Sue Gardner. She remembered the International free software conference she attended at Trivandum on 2008 december. Our workshop on offline wikipedia versions started at 2.30. Martin Walked introduced the workshop to participants. Manuel Schneider from German wikipedia explained the Openzim format for offline compressed storage of wikipedia and the available readers on desktop computers and mobile phones. Shiju Alex introduced the Malayalam wikipedia offline verision 1.0. I talked about the issues and solutions for providing an offline version, particularly a non-latin complex script wiki to users in CD ROM or DVD. I demonstrated sample offline wikis on Hebru, Tamil, Polish, English, Japanese with the wiki2cd tool. There were a couple of questions on wiki2cd and openzim. Kul Takanao Wadhwa and Tomasz Finc from wikimedia foundation who are focusing on offline wiki projects attended the workshop and we had a discussion after the talk. The offline wiki workshop continued with Pediapress team. They are the people behind the recently added export book/PDF feature of wikipedia. Unfortunately this feature require lots of improvements to get work with Indian scripts. We met Gerald M, who focus on language support of wikis. He is such a person with amazing passion towards our local language wikipedias. We discussed on the technical issues of the local language wikis. Siebrand joined the discussion and he pointed out some improvements in wiki2cd software. On the second day I met Volker Haas, the developer of PDF export/books feature of wikipedia. The library used by the extension of creating PDFs is Reportlab. But it does not support complex scripts such as Indic or Arabic. We have a long discussion on possible solutions. Discussed the Reportlab code. the mwlib code, and the s/w which I am writing now a days to provide complex script pdf rendering APIs. We will continue to try out some of the options we have to solve this issue soon. Martin Walker, who presented the Article Selection process of English wikipedia along with us in the workshop invited me and Shiju for a dinner with his family. And we went for that. The third day started with plenary session by Jimmy Wales. He talked about small language wikipedia and the issues faced by them. He emphasized the need for offline versions of wikipedia to reach more number of people and talked about the Malayalam Wikipedia offline version. I will be attending Wikimania 2010, Gdansk, Poland. This annual international conference of the Wikimedia community is from July 9 to July 11. I will be presenting wik2cd, the tool I wrote for Malayalam wikipedia version 1.0 there in a joint workshop with wikipedia offline developers. I will be joining with Manuel Schneider, Shiju Alex, Martin Walker in the workshop titled: Creating offline version of Wiki content – Solutions and Challenges. Apart from this, I will be meeting pediapress team, the team behind wikipedia’s latest PDF/Book export feature. There are some issues in this tool for working with Indic languages, mainly because of the PDF rendering engine not capable of rendering complex scripts. Thanks to Wikimedia foundation for granting me a scholarship to cover travel expenses. As part of Malayalam Wikipedia Meetup 2010 , today Malayalam wikipedia releases 500 selected articles on a CD ROM. This is the first time in India, a Wikipedia on local language releasing its articles for offline usage. I handled the technology part of the project. Automate the process of getting the page and the images in it. Wikipedia articles changes frequently. So we need the program to fetch the latest article from wiki whenever it is executed. Provide an categorized index of the articles for easily locating the article. Provide a search in the article titles. ISO 9660 filesystem of CD/DVD has lots of limitations. There are restrictions on unicode names of the files, length of the file names, directory depth, special characters in filenames etc. Wikipedia has its article and image names with unicode, special characters and most of the time they exceeds the filename length. To avoid all these, we should rename most of the files and then fix the cross references in all files. Manually solving all these challenges is not the way to go. So I wrote a program, which just takes the article titles and does all the above tasks and finally creates a repository ready for burning to CD ROM. Wget disappointed me in fetching the content from wiki. There is an open bug in wget which make the download of non-latin URLs impossible. Have a look at the CD content we created : Malayalam Wikipedia Selected 500 Articles . Hiran helped me with the artworks. Since entire process is automated, the program can be used for any other language. I am releasing the program for the benefit of everybody. You can get the program from here. It is written on Python. Jquery was used for the UI. For details on the usage, customization etc read the wiki page of the project. For those who can’t read Malayalam, here is a sample wiki created by the wiki2cd program from English wikipedia by selecting 10 articles. Malayalam Wikipedia Community hope that this is a big step to reach the majority of the people who does not have internet access. If printed, this 500 articles will be at least 5000 pages. CDROM also includes information about commonly used free software based tools for Malayalam computing. Some writing tools and fonts are distributed in the same CD ROM. Thanks to Malayalam Wikipedia for giving this great opportunity to wok on this project. The ISO image of the CD is available here for download.